The land which began to collapse on Boxing Day last year near the top of St.John's Street is finally going to be repaired this coming Monday. About time too. Have they fixed the drain yet which was the cause of the problem in the first place? Not sure if the Mitchell Lane storm drain was responsible for the damage Peter. 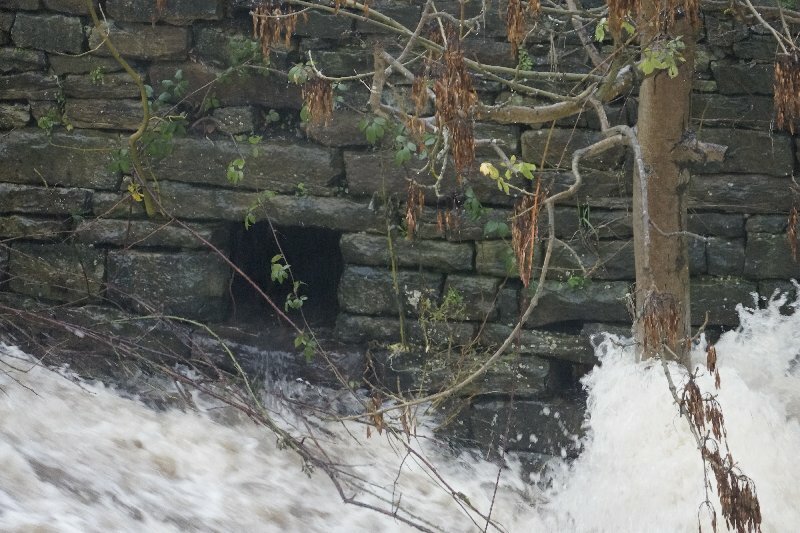 Bradford's Senior Land Drainage Officer inspected the beck exit of the culvert leading from the storm drain & found that the culvert had had a plastic liner inserted into it. On that basis it was his opinion that no undermining could have taken place to cause the sinkage. Months later, the sunken area around the storm drain was filled in & tarmaced. It remains a mystery! 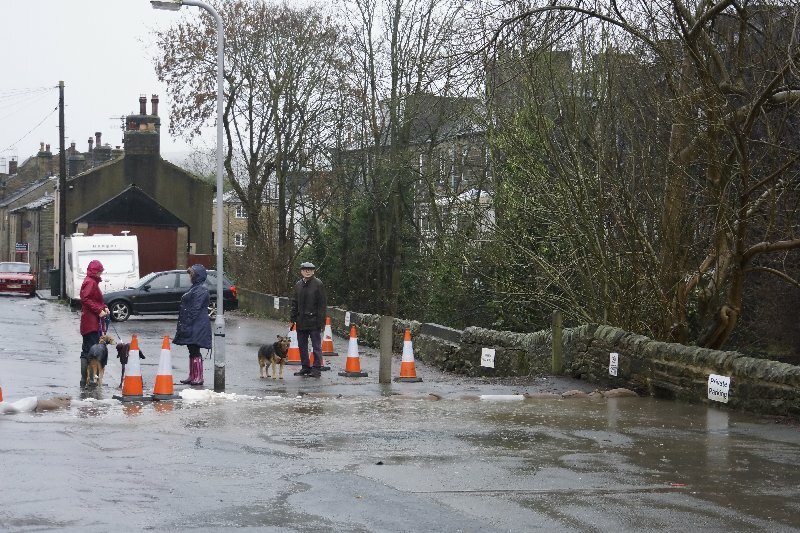 Picture taken 26-12-2015 - water flowing from the park down Mitchel Lane flows over the storm drain at the bottom of the lane. 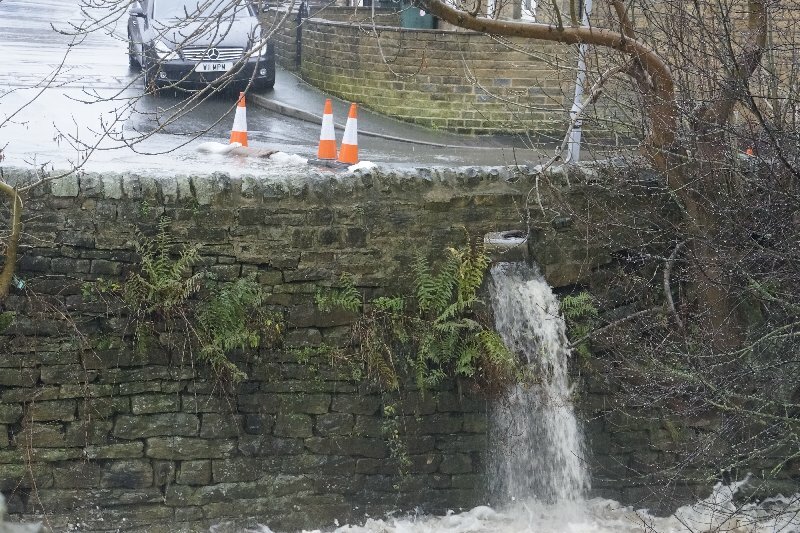 Picture taken 26-12-2015 - the water from the storm drain should flow into the beck but there isn't much coming out of the outflow. Picture taken 26-12-2015 - the outflow from the diverted water shows how much water was not drained via the storm drain. Picture taken 27-12-2015 - this picture was taken the following day and clearly shows the storm drain is blocked. 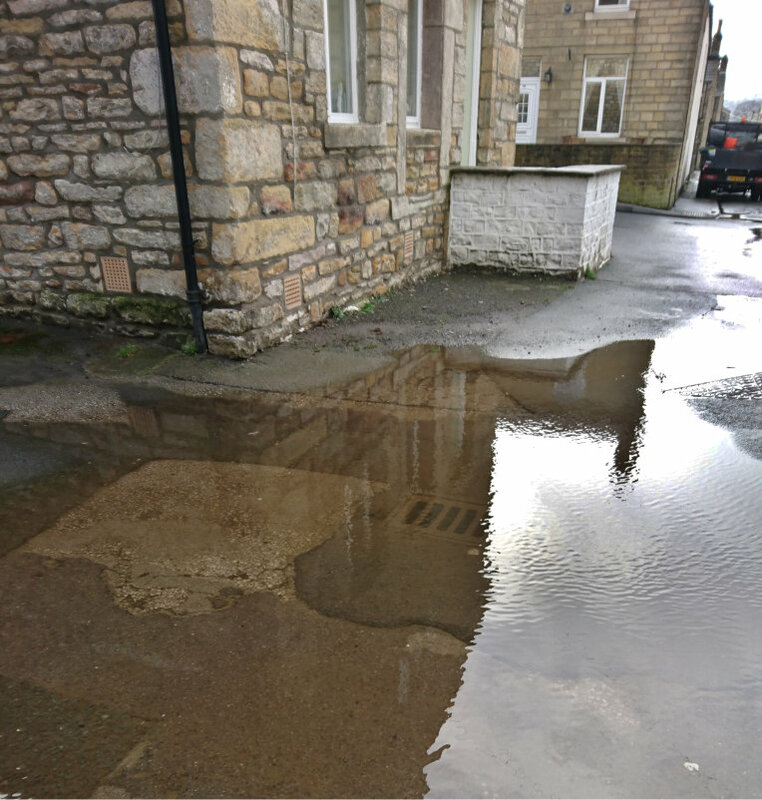 The reason Bradford are saying the drain is not leaking is because if they admitted it was leaking they would be liable to the repair of the area of subsidence. 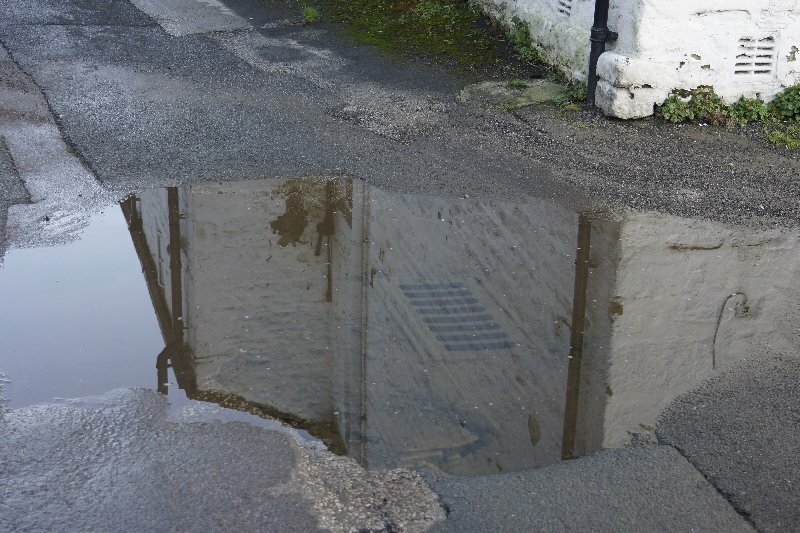 Lets be more positive on this Peter, surely the contractors will make good the drain when repairing the road. The Job so far, and the drain, well i,m leaning towards it is not going to be repaired ( no one on the site was able to answer my questions ). I managed to speak to the good blokes undertaking the rebuilding of the Beck wall this afternoon. To be fair one of the chaps was unsure as to its reason for its collapse but another chap..who appeared more intelligent explained to me his reasoning of why it collapsed. He categorically believed that it was water coming from the top of the wall at St John’s Street rather than water damage as a result of force from below at stream bed level. His reason being that the foundations to the wall were perfectly in line and not out of abutment so it wasn’t undermined by water from the beck. However this chap was not fully aware of the issue with the drain at St John’s Street being overloaded / damaged / insufficient; In fact he was to the understanding and belief by some folk that water had been rushing over the wall had resulted in the collapse. When I told him about the issue with the drain he immediately changed his overall understanding and went on to state that water beneath the road surface then had likely channelled its way through the sub surface to the wall head and the subsoil by the wall subsided to cause the overall collapse near to its top. If you go and look at the damage face on, you can clearly see that the subsurface beneath the tarmac on the top left side, towards the St John’s Street drain, has given way and is much looser material than the rest. Ironically he then went on to point about the trees within the embankment stating that their roots wouldn’t have helped. I state ironically here because this is exactly what I had explained previously here on this website. Any doubters as to my credentials and this story go ask them and see for yourself. Well done Corky Yorky, now you have highlighted the drain issue with the men on site, hopefully they will investigate it more thoroughly. Is it me or have they made the tarmac slope away from the wall and the 'outlet' hole thus directing more water down St John's Street instead of into the beck? I see the hole in the wall has been put back but I'm not sure how any excess water is going to go through it because it looked to be too high to me as well. Perhaps it's a optical illusion, or perhaps the residents of St Johns Street should hope the storm drain at the bottom of Mitchell Lane has been fixed. Will this mean the end of this? This problem was highlighted by the flood on Boxing Day 2015 but the problem existed years before. It's almost 3 years since the 2015 flood let's hope something is at last done about this problem. Finally, this AM, work has commenced digging down to reveal the pipework/culvert between the storm drain at the bottom of Mitchell Lane & its outlet into the beck below the weir. 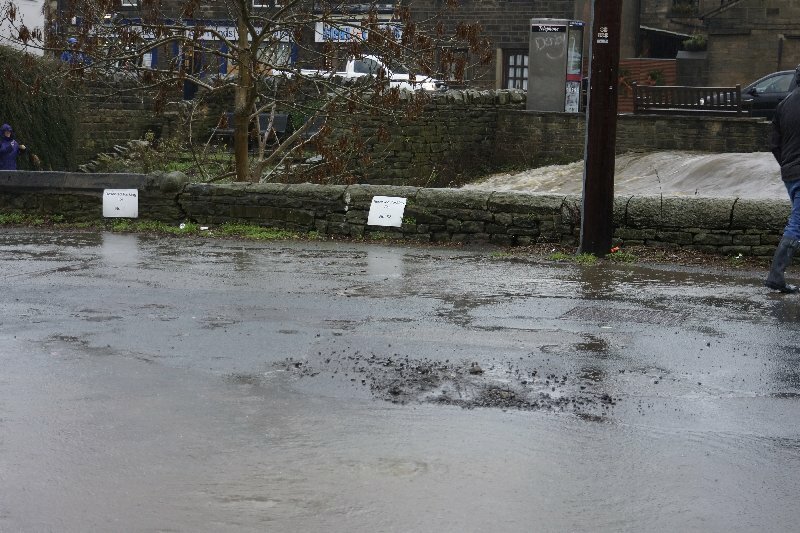 The consensus opinion of Bradford Council officials & contractors is that the drain has collapsed. However, talking to the men digging on site, they have revealed that there is an old culvert extending in for a few yards from its exit into the beck which has then been connected to a fairly large bore pot pipe which has a smaller bore pipe liner inside it. The work continues, all will be revealed! !